Introduce yourself and tell us about your role in the Quiz Club. I’m Surya and I am a member of the Quiz Club. This is Shyam and he is the Chief Event Organizer. How many office bearers does the QC have? Five: The chairman, Secretary, Treasurer, Chief Event Organizer and the Lady Representative. Who’s the chairman of the QC? Sangeeth Raja from ECE final year. The first thing that we wanted to ask you before going into the details is that basically, Quizzes are something people are passionate about. I see a lot of people from childhood who have been Quizzing all their life. But there are several who think “No, this is not for me, I am not really good at that”. So for all those people, who are afraid of quizzing, how do you think you can help them in getting over their fear of quizzing? For instance, I’m really scared of Quizzes. If you want me to participate I would just run in the opposite direction. So, how do you think that can be overcome? To all those people who are afraid of Quizzing, I’d like to say this: Quiz is not like a Science subject that you study and do, but like a game that you can learn, if you practise and practise. It’s a lot like sharing what knowledge you have with others. Half the time we just cover TV shows and sports. The majority of what we conduct is Sport and Entertainment. Very rarely do we go to history or GK. You need not know the answer right in the beginning, you can always work and guess it from the question. It is a bit different from conventional Quizzes, the way we do it at QC. So your club is mostly comprised of third years and final years, or does it have a lot of juniors turning out to meetings? The first years will be joining clubs the next semester. So what is your idea for getting them to join QC? Yes, we have quite a few second years participating. And as for the first years, the first thing is to make them aware that our college has a club exclusively for quizzing. We plan to promote through Facebook and conduct quizzes for first years alone. When we were first years we’d go for quizzes and keep scoring negative marks. Usually, for each question you get +10 if you get it right, -10 if you get it wrong. And inexperienced as we were, at the end of the quiz we would have scored like -50. And as time went by we learnt how it all works and now we are making a mark in quizzes in other colleges also. This is what the first years can look forward to if they join QC. Harini was talking about this fear for quizzes. This type of negative marks thing is exactly why people feel scared of quizzes. And you guys say you stuck through even if you got negative marks. So how do you stay motivated? Does Quizzing actually increase your motivation levels and help your careers or is it that you guys are really motivated and that helps you in Quizzing? Which is helping what? We don’t think about this motivation part in a serious, ‘career’ sort of way. We do it in a fun way. And we also have a lot of repeating questions. If they keep attending sessions, they’ll gradually do better because the questions become familiar. I still remember the first quiz I went through. It was sometime in the second semester, I guess. Pranav, a senior from 2011 batch was the quiz master. We remember just sitting on the bench and just looking at the questions. We couldn’t answer a single one of them. And we got a -50 and came out. What I understood from that quiz was that I didn’t know anything about the world. *Chuckles* But then we started attending the quizzes again and again and then managed to answer one or two questions. There were a bunch of fourth years when we went who were totally on another level. They used to fight for the answers. They used to quote sources and argue that the other team had it wrong, and we were just looking on. So do you think in a way, those seniors were the reason you stuck to the club for so long? Definitely. They are a big reason, they always kept us engaged. They are our inspiration. Alright, so how long has quiz club been going on? When was it started? The Club became official last year i.e 2015. Unofficially, it’s been running for five or more years. It used to be a small bunch of people who just really enjoyed quizzing. So, was there anyone who played a pivotal role in starting this club, making it official? Praveen Adithya, from the 2008-09 batch came up with the idea of making a club for quizzing. Sudhan and Venkatakrishnan, they were pivotal in making it official last year. Who is the most interesting person in the club? Have they done anything you will never forget? If you ask about the most interesting person in the club it is Vivekanandan Balaji. There was a question for which the answer was some car company. We had a fairly good guess that it was a medium-range car manufacturer. It was actually the right answer, but he insisted that he was not going to settle for some mid-range car, pounced, and said with complete confidence “Lamborghini”. We lost 10 points but that was the most fun we ever had. In a quiz, we have this thing called ‘pouncing’. If you’re really sure of the answer, you can pounce. Otherwise you can just wait your turn. Balaji had this bad habit of pouncing just for the heck of it, even when he didn’t know the answer. So what quiz events you have attended outside of college? 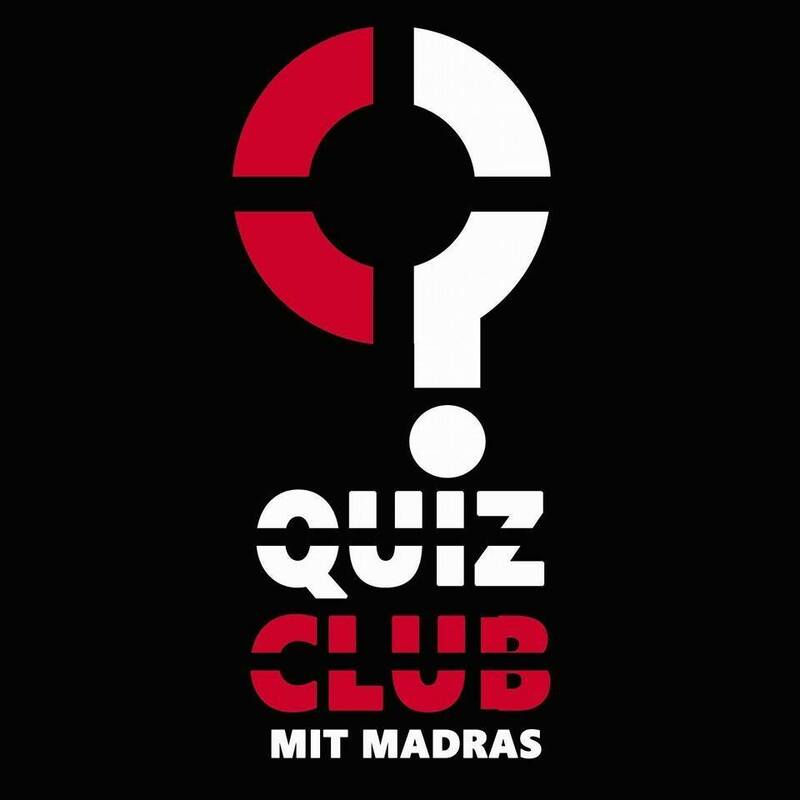 Around Chennai, there are a lot of prominent Quiz Clubs, like that of IITM and SRM. We have attended several events that they have conducted and they know that MIT has a club of enthusiastic quizzers too. You guys conducted an event last year. And I believe it was the first time such an event of that sort conducted at MIT? Tell us about it. Right from the formation of the club officially, we had the idea of conducting an exclusive quiz event. It’s called Blitzkrieg. It means a lightning-fast attack and the word is used to describe how Hitler attacked Poland during World War II. There were no funds, because it was the first event of the kind. The Dean was very supportive and helped us with the venues and projectors, but there were other expenses. The seniors and alumni chipped in, but mostly we were self funded. The chief guest was the Nawab of Arcot, and he is an Ardent Quizzer. He’s conducted Quizzes around the world. So how did the event go? How many teams participated? We had two types of events, an Intra-MIT and an Inter-College Quiz. 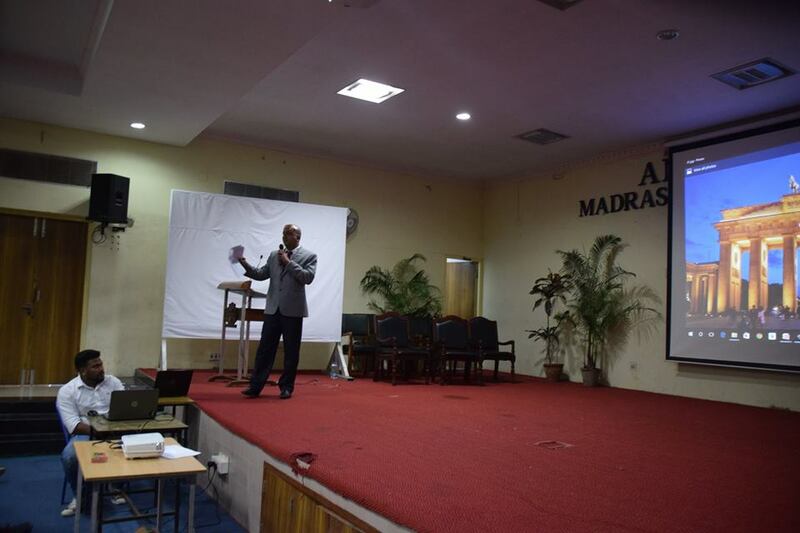 We conducted the Intra Quiz in the forenoon session and in the afternoon, the Nawab conducted the Inter-College Quiz. More than 120 students participated, with teams from SRM, IITM, Loyola etc. We had arranged for the first, second and third place, and then Nawab also surprised us by saying he would give prizes for the fourth, fifth and sixth places also. All the finalists got prizes. Have you guys started planning for the next Blitzkreig? Yeah, we have tentatively set the date as March 4. We tried last year to invite the Sumanth Raman, so it would be great to get him this year or some other Quiz Master like him. So, what are your short-term and long term goals? First, before you leave, what do you want to achieve? And second, two or three years later, when you check the Club’s Facebook page, what do you want to see? For the past two years, the club has been like a family. We all knew each other personally. But now, with the club having become official and with the new people, the focus has shifted into a more organizational direction. A major problem is getting the members to come regularly. And we also have to reduce the difficulty level to get more people enthusiastic about participating. Before we leave the campus we wish to purchase a projector for the club. Previously we used to borrow from some of the departments. How do you plan to gather funds? We will be having members personally fund this year as well. Adding to it, we believe that, since we have done the event once, we expect certain companies which sponsor quizzes to financially support the club. How often do you guys quiz? What fields do you focus on? We conduct quizzes every week. There are two types of quizzes, general quiz and SPENT quiz. SPENT stands for Sports and Entertainment. We predominantly focus on world events and history. When it comes to entertainment we focus mostly on English TV shows, which is not welcomed by participants who do not follow such shows and some girls complain that they don’t follow cricket unlike guys. With all these requests put forward, according to you, should a quizzer be? I think the participants should have fair share of knowledge of everything. In my first session there was a question about how Nelson Mandela after being released from prison asked “Is he still alive?” The answer was ‘Don Bradman’, one of the best cricketers in history. Usually, people would assume that he is referring to a political figure which isn’t the case here. During Apocalypse there was a question with the following clues, the picture of a calendar showing the current, previous and the following day along with the jerseys of Raina, Amla and Bailey. Along with these, there was a picture of the Lone Survivor movie. From the calendar and jersey numbers (1,2,3) the clue was “Indru Netru Naalai” and Lone Survivor was to comprehend “Thani Oruvan” and the connect was Hip Hop Tamizha. So, the clues weren’t directly related to the answer. Hence, knowledge of different fields would help in cracking the question and that’s the most fun part. The way you’re taking the quiz is different unlike the conventional way. Yes we call it the new age question. Do you guys conduct online quizzes? Yeah. During symposiums we do it. Once in a while we post question of the day. It is more like the person with the fastest internet connection wins. Interaction is also essential for quizzing. Who is the most active member in the group? The chairman, Sangeeth is the most active. He is obsessed with working hard. He is into quizzing and organises well. You must have faced many hardships and overcome obstacles through these years in keeping the quiz club running. What was the most difficult challenge and how did you overcome it? The biggest challenge we have always faced is the response from the students of MIT. People are still afraid of quizzes. They know that a quiz event is happening and they try to avoid it. Also they get demotivated immediately after their first participation when it doesn’t turn out well. Over the course of time it is the same set of people participating in every symposium. That is a challenge too. So how do you plan to bring people into participating in quizzes? We are trying to make it more fun. We are planning to introduce more questions about Tamil cinema. We plan to bring in memes. We hope to stick to whatever is trending. The participation has been a bit dull comparing with the last two years. There is a lack of awareness among them. We plan to work on that. Do you think our curriculum prevents us from participating in non-technical events? Of course. But I have seen people who live for quizzing. There was Pranav, one of our seniors and also two teams from SRM University. They participated in quizzes in all colleges around the nation throughout the year. Even IT companies organise quizzes. It is quite difficult for us to do this managing our academic endeavours. Fixing a day a week for quizzing is quite difficult. Nowadays juniors skip quizzing sessions on Friday due to an exam on Monday. We are not sure if it is their new curriculum that forces them to do this. What plans do you have for Mitafest? We will organise quizzes during Mitafest. Not just that, we organise the event during all symposiums. 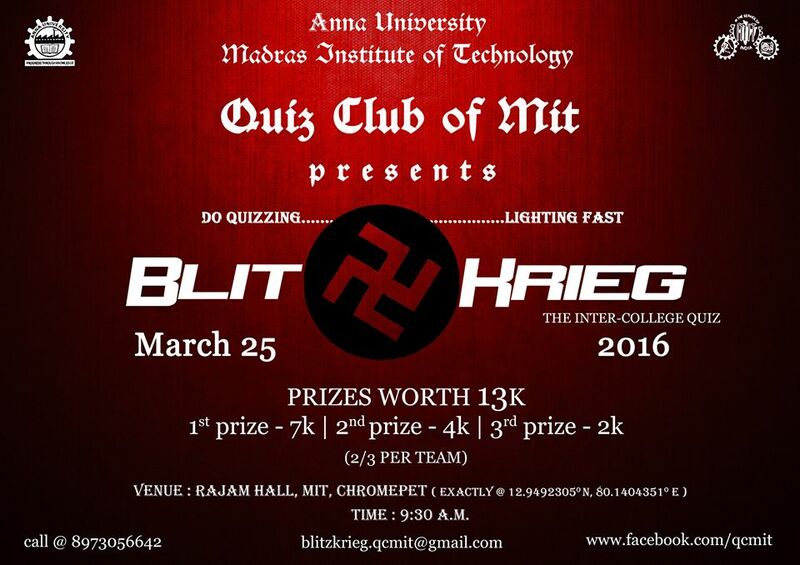 We are the official quiz partners for all the Departments of MIT. That’s great. Our last question is, what message have you got for our readers? Winning a quiz is the least important part of the quiz. It is all about participation. If eliminated in the preliminary rounds, watch till the end. It is pure entertainment. It is like watching a movie. You’d definitely know the answers. Relating your answers to the questions is the important task because the answers are always around you. Practice helps in improving your quizzing skills. Interviewed by Harini Subramaniam, Final Year Aeronautical Engineering and Niveditha Rao, Final year Information Technology. This entry was posted in Chill With Quill, General, Interviews. Bookmark the permalink.